Looking for Great Restaurants in Lockport NY? Then look no further! The Hilltop Restaurant is a family owned and operated business. We provide a family friendly atmosphere where your children are always welcome. Our restaurant is located right on Route 78 in Lockport, New York, and is a prime location for hosting a business lunch with your colleagues. 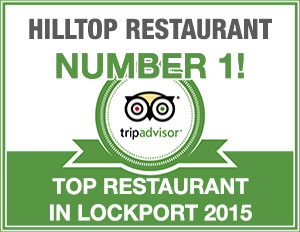 The Hilltop was ranked as the best restaurant in Lockport by Tripadvisor in 2015, and is one of the top restaurants in Lockport NY, and the surrounding areas. Any way, any amount. Ex. Buy 6, get 12! Dine-in only. Food and drink specials at the bar. The Hilltop Restaurant prides itself on offering amazing daily specials. We have new content posted almost every day, including specials that aren't on our normal menu. The Hilltop Restaurant has a full service bar with wine by the glass and the bottle, beer on tap, and craft brews. View our wine and craft beer list here. The Hilltop Restaurant utilizes local food sources that we have at our disposal. Including Hiller's Farm Produce, Miller's Horseradish, and Pudge's fruit salad. We live in a large farming community, and it makes a huge difference to use fresh vegetables and foods. As small as dine-in, and as large as 300 guest events, we offer unbeatable catering in Lockport NY, and the surrounding areas including: Buffalo, Amherst, Tonawanda, Medina, Olcott, Williamsville, and more. View our online catering menu, and book The Hilltop Restaurant for your catering needs for your next event!